I’ve hosted two meals since arriving in Paris a few weeks ago. 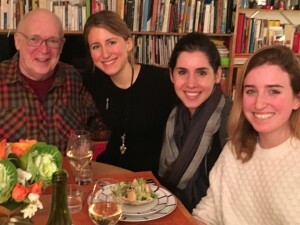 The first was a festive New Year’s Eve dinner that included several courses, while the second was a casual soup and salad supper for three millenials in Paris for studies or work. 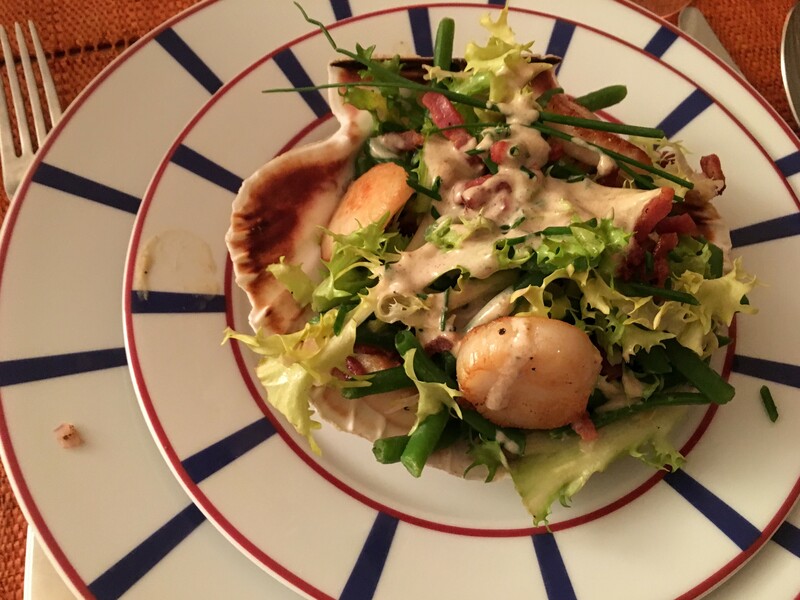 On both occasions, our meal began with a delicious winter salad prepared with frisée, scallops, haricots verts, and bacon lardons–so versatile it fit easily into each of these distinctly different menus. 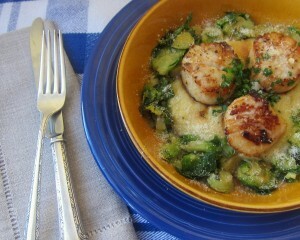 This past week I taught two hands-on classes titled Paris Spring Cooking. 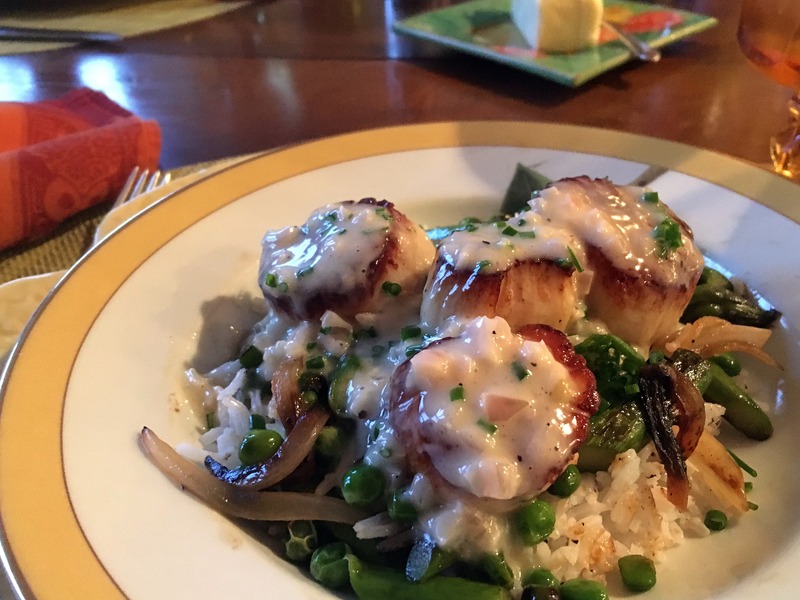 The menu included artichoke soup, scallops with asparagus and peas napped with beurre blanc, and as sides a watercress and orange salad, and crispy rice cakes with Comté cheese. By far the technique that interested my students most was that of making the celebrated French sauce known as beurre blanc. Ringing in 2015 in Paris! This year we’ll be in Paris to ring in 2015, but, rather than dine out in one of the city’s restaurants, we’ll be cooking a meal with our friends, Harriet and Philippe, who live there. Our hosts have decided that after marathon Christmas entertaining, we should follow a simpler philosophy of “buy some, make some” for this special night. And, happily, that’s especially easy to do in France. 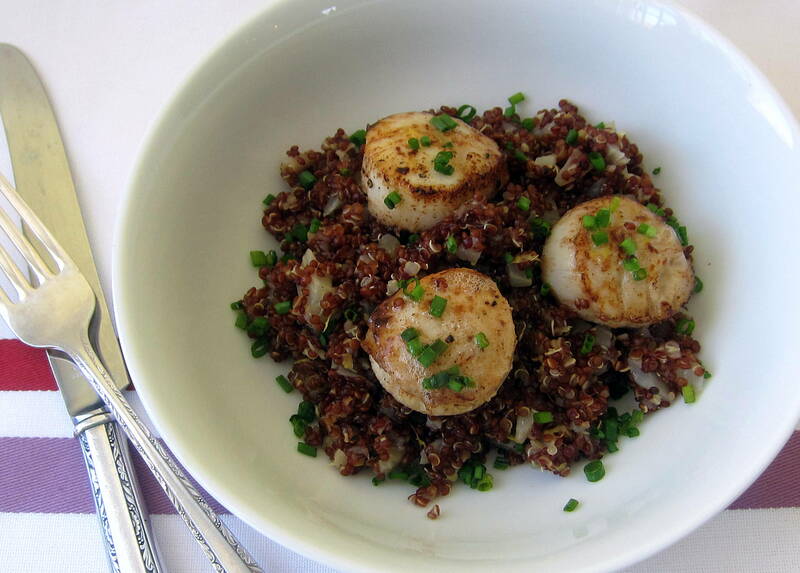 Red Quinoa Is So Cool! Last week we drove into Boston to take advantage of the city’s annual Dine Out Boston. For this event, many of the town’s best restaurants offer $38 three-course menus. We opted for Zebra’s Bistro in the western suburb of Medfield and were joined by our son and his wife, food lovers par excellence. Wontons stuffed with braised short rib on sriracha cole slaw and crispy falafel garnished with beet yogurt were winning starters. Braised lamb stew with homemade pasta was a delectable main, but my favorite dish of the night was pan-seared trout atop a warm red quinoa salad. In Paris, my local cheese store, Quatrehomme, always has an array of savory tarts ready to be sliced and taken home for reheating. Recently, I noticed one made with mild, lovely Cantal cheese topped with sliced tomatoes, another prepared with extra creamy Reblochon cheese and ham, and a new combo of brébis (sheep’s cheese) with smoked ham. A few steps away at La Grande Epicerie, a spinach and fresh salmon torte encrusted in a rich golden pastry shell was equally tempting. 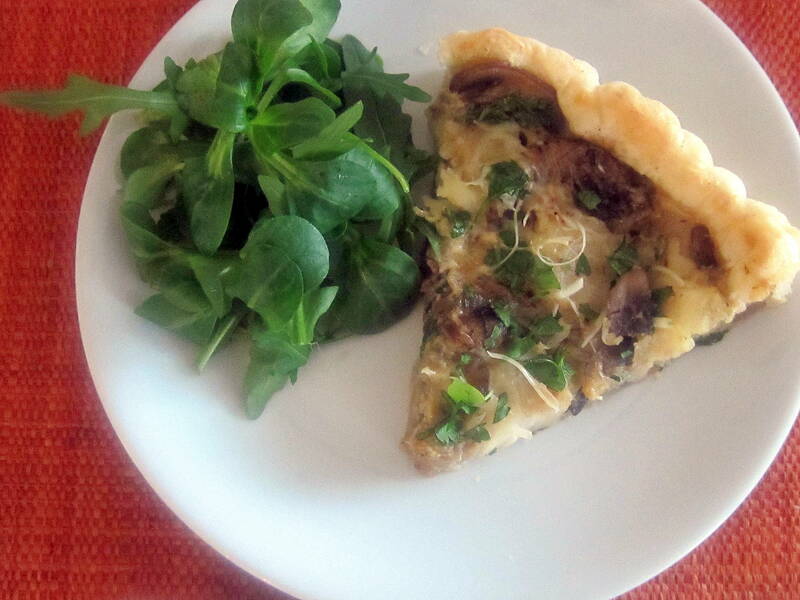 All were inspiration for the mushroom and scallop tart I made for lunch a few days ago. About a year ago my book club decided to change its monthly meetings from Sunday afternoons to Thursday evenings. With the change came the suggestion that the usual appetizers and sweets that each host served be replaced with a soup and salad supper. I don’t know whether it was the new time or the menu, but ever since we switched to the current format, attendance has soared! September is my month to host, and last night I welcomed everyone to my home. 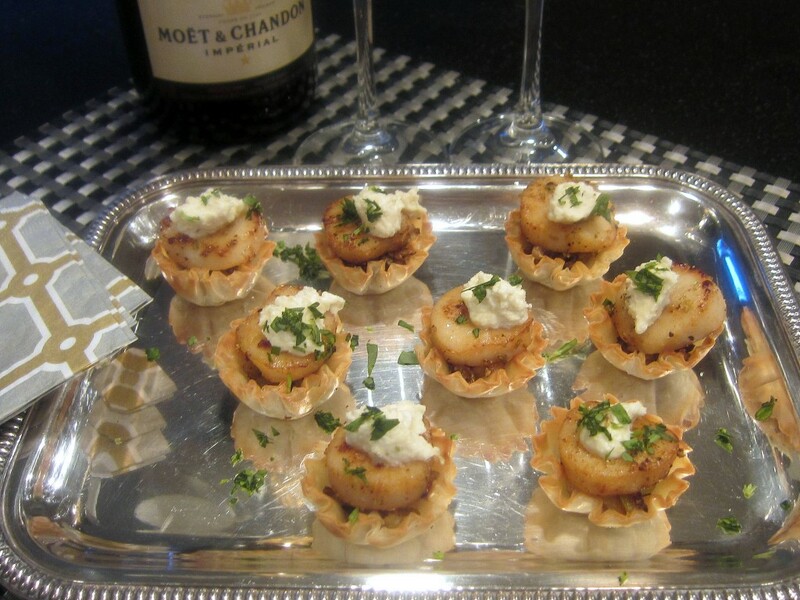 Since our book selection was Dearie: The Remarkable Life of Julia Child by Bob Spitz, I planned a menu that I thought would be worthy of this culinary icon. 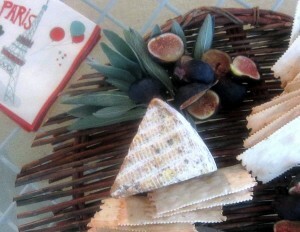 For openers I arranged French goat cheeses on a wicker tray along with fresh figs. 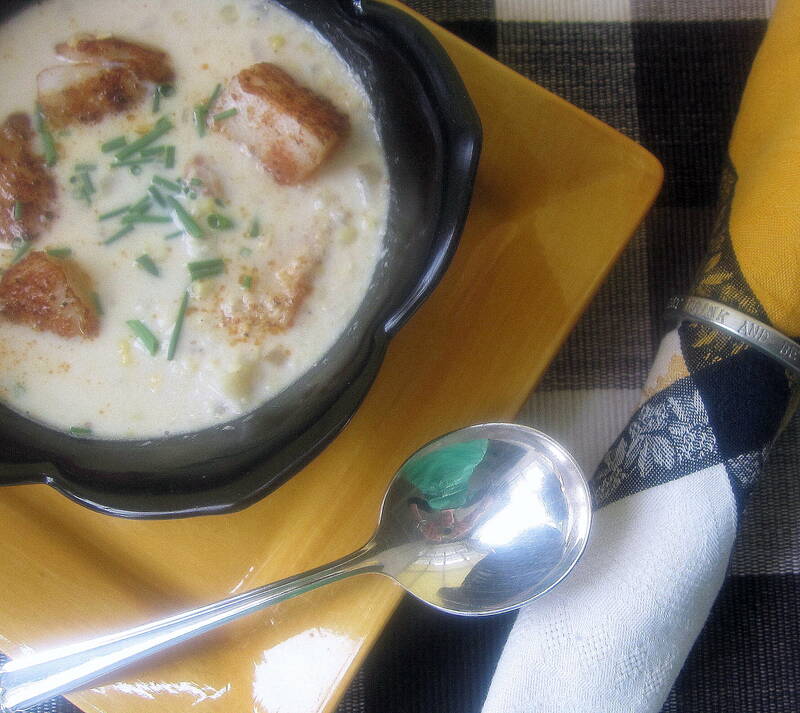 The soupe du jour was a hearty New England scallop and corn chowder garnished with fresh chives from my book Sunday Soup. 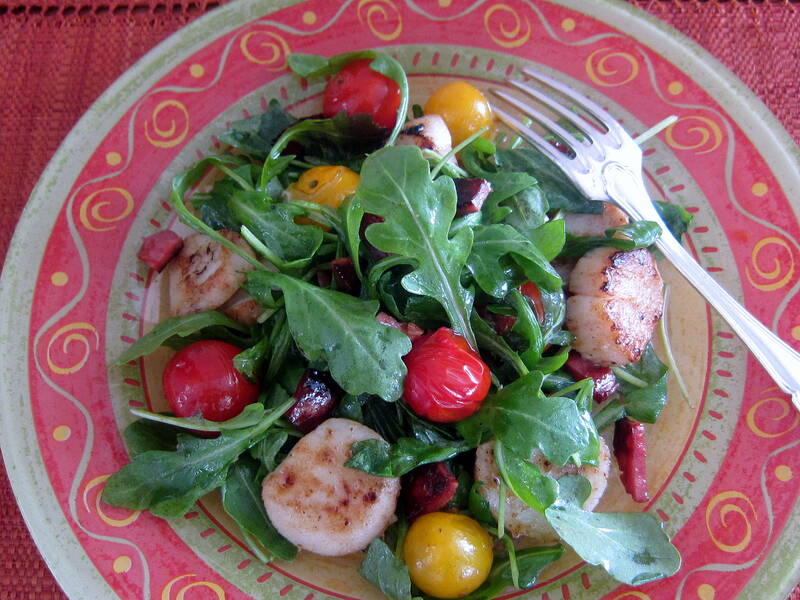 A salad of heirloom tomatoes and arugula tossed in a sherry vinaigrette was a colorful accompaniment while individual crème brûlées topped with almond and pistachio brittle made a sweet ending. Cooking Like A French Chef- Bien Sûr! When in Paris, I make a point of going to small, new bistros, most of which are overseen by young French chefs. I book these tables because nowhere is the food more inventive or reasonably priced. These gifted cooks, who buy fresh seasonal ingredients and pair them in unusual ways, know no boundaries when it comes to creativity. My mouth still waters when I think of a perfectly sautéed cod fillet served on a gratin of potatoes laced with bits of ham and Gruyère that I sampled one cold winter night. At another bistro in mid-summer I savored every bite of that same fish set atop a colorful ratatouille. Succulent slices of roasted rib of beef offered with batons of blanched celery root and a garnish of crisp baby romaine leaves caught my eye and my palate on another visit.